One of the exciting things to do in Los Angeles is to explore the historic theatres that once was at the heart of downtown during the golden age of Hollywood. 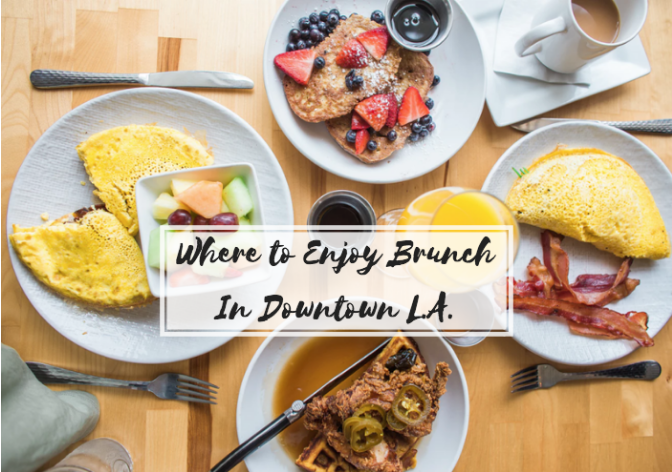 While you’re out exploring downtown, check out some of these fantastic downtown LA brunch spots. Whichever one you choose, you can’t go wrong! If you’re looking for one of the best places to enjoy views of the city, look no further than Perch. This rooftop French inspired restaurant, sits atop one of the buildings located in the heart of downtown. The end result is beautiful views of downtown Los Angeles amidst skyscrapers. For brunch, enjoy options such as french toast, charcuterie, omelette, smoked salmon benedict and more. Don’t forget to pair it with a bellini, mimosa sangria or other cocktail. When looking for country cooking and classic American comfort food, look no further than Poppy and Rose. Try the biscuits and gravy, pulled pork hash, steak and eggs, eggs benedict or fried chicken and waffles. If you’re hungry, get the Lumberjack pancake breakfast which comes with buttermilk pancakes, two eggs, brick hash, and bacon or house sausage. During the day, this downtown LA fixture is known for their handmade pizzas and fresh pastas. Weekends however, are all about brunch. Choose from items such as belgian waffles, french toast, spinach and goat cheese omelette, smoked salmon benedict, lobster hash and lemon ricotta pancakes. When you’re looking for a sophisticated brunch with friends, look no further than Bottega Louie. Wish you could have breakfast anytime you wanted? That’s why Blu Jam Cafe offers breakfast 7 days a week from 8am - 3pm, which is when the restaurant closes. Enjoy options such as chilaquiles, breakfast burrito, morning hash that comes with scrambled eggs, black forest ham, baby spinach, onions, sundried tomatoes, grilled potatoes, mozzarella and toast. Vegan and gluten free options available.